La plancha grills or hotplate barbeques are perfect for easy outdoor cooking and in my view fill some important gaps in the market. Hotplate barbecues are very popular in Australia and South Africa (where they are called Braai) and offer a different alternative to the charcoal grill. This is especially so when you can't use a charcoal grill for risk of bush fire. The hotplate barbeque will see you through. 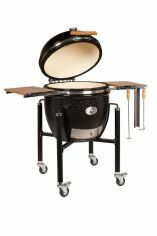 The smaller units are portable and great for cooking meat and veggies altogether. 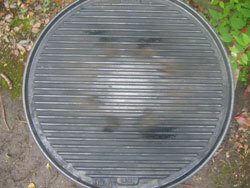 When I go camping I'm amazed at how many fellow campers have a Cadac grill or something similar. The Cadac is originally a South African design and with the addition of new equipment has now developed into a complete range to support different cooking styles. Cooking “a la plancha” is the Spanish (where I get many of my tapas barbecue food ideas from) phrase that translates into the hotplate and it is extremely popular in Northern Spain and to some extent in the Basque area of France. So whether it's France, Spain, Australia or South Africa, hotplate cooking is gradually catching on the world over and it is a great way of cooking outdoors, perfect when you're grilling for a large number. Click on the links below to see some of the equipment available and also get my opinion of how well they cook. 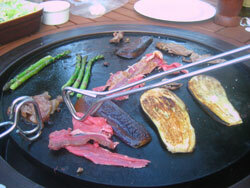 This Barbecue Galore hotplate grill review is close up. It all comes from my experience of cooking on it. It looked like it was going to be a lovely weekend so on the spur of the moment my friend Neil decided to organise a barbecue. That wasn't the only weekend it happened also to be the anniversary of his wife's death so we chose to make it a fund-raiser as well. Neil pulled this incredible hot plate grill out of the garage, something that he had borrowed from his local Scout group. Well that was as good as it got as far as Neil's resourcefulness goes. The cooking side of things was clearly not his forte so I took over. 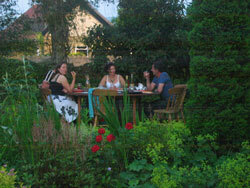 After all it was a good opportunity to experience cooking on a different barbecue. 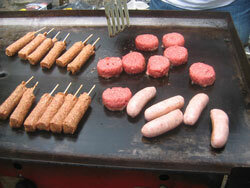 The Barbecue Galore consists of a large gas fired hotplate and central fat drain. There are three rows of burners that have to be crudely lit from underneath using a match – so take care. The heat regulation is by knobs on the side however I found it better to actually look underneath at how fast the burners were going rather than to trust the gauge on the regulator knob. Warm the grill up then turn the burners onto low. This is especially necessary when cooking for large numbers otherwise you'll just end up flipping burgers (or whatever) and still finishing with a burnt offering. Keep the fat drain clear. It can easily get clogged up with the crisp residue of your cookout and once blocked there's nowhere for the fat to go. If catering for a large party, get plenty of food on early. You can always keep stuff warm but it's impossible to speed up the cooking process without burning and (possibly) creating a health risk. Ultimately the Barbecue Galore is a catering tool in that you can grill large quantities of food in a short space of time, it's also good for doing associated veggies like fried onions with a hot dog but that's where the versatility ends. There's no hood so no opportunity to experiment with indirect cooking or adding smoke flavour with wood chips. If you're looking for anything other than a basic grill that can cook large quantities then you're going to be disappointed. Sadly the rain came but that didn't stop the fun or the fund-raising, a great day in memory of Sandra Wilkinson. I've used portable Cadac hotplate grills (known as Skottels) for many years whilst on camping trips and now that I've started my section on hotplate plancha recipes it's appropriate that I give you my experience of using them. Born in South Africa, the range has been around for many years and continues to evolve. My first portable Cadac Handichef skottel consisted of cast iron plate that set on a burner and then connected to a gas bottle by means of a metal tube. It proved to be satisfactory although I found that the hotplate needed a lot of oil to stop food sticking so the food didn't really look that appetizing and cooking it almost required protective clothing because of the spitting oil. 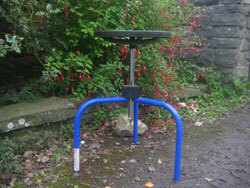 It was also difficult to get the thing to stand firm on an uneven camp ground. Things have moved on (I'm happy to say) and the first improvement was to add a tripod so at least thing could be considered safe to cook on. I should also point out one handy thing is that the hotplate is reversible so ribbed on one side for putting perfect grill lines down your steak and smooth on the other – ideal for eggs in the morning. The latest range of Cadac hotplate grills are none stick and there's also a variety of alternative cooking units to sit on top of the burner, my sister uses her paella pan all the time. Whether cooking an evening meal in a rich sauce or that great British fry up in the morning, it's always on the go. I still prefer to take my charcoal grill when camping but if you're the sort of person who likes to camp but wants a more conventional method of outdoor cooking than charcoal then there'll be something in the range of portable Cadac skottel grills for you. If however you're looking for this style of outdoor cooking to do at home then check out the Red Hot Plancha for what has to be the ultimate in social outdoor cooking on a hotplate grill. It is an evolution, but my first experience with a Red Hot Plancha hotplate barbecue grill turned out to be a revolution. I say it's an evolution because what the guys at Red Hot Plancha have done is take the simple concept of a hotplate and turned it into a dining experience, something that your dinner party guests will talk about for many days to come. The nice guys at Red Hot Plancha were kind enough to send an example to me for trial so the day it arrived I hastily organised a meal for my neighbors to see what their reaction would be. “I'd buy one. We have a gas grill but I don't use it because I spend all my time with my back to the party slaving over hot coals. This is different because I can party and cook at the same time”. What Is A Red Hot Plancha? It's a gas fired hotplate integrated into a circular dining table and the concept is that everyone sits around the table and cooks their own food on the central hotplate. 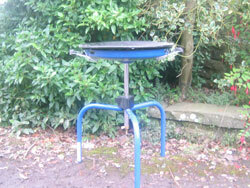 There's a battery operated ignitor and circular burner under the hotplate and the central pillar of the tables acts as a store for the gas bottle. The instructions stated that for the best results you should fire it up on full for a couple of minutes, then turn to low, splash on a lug or two of oil and start cooking – and it worked. Talking to the manufacturers there's lots of developments in the pipeline too. Different styles of table, electric planchas and more accessories.